Birthday by Solar date. 30th April, but celebrated usually 2nd May. LUNAR BIRTH DATE night of 21st/22nd May 2019 (Vaishak month, Krishna Chaturthi). Access to Sri Ma's samadhi 22nd. Date to be confirmed when Bengali calendar published. Known also as Jhulan Purnima. (swing festival.) The night of Sri Ma's self initiation. Celebration of the GODDESS, the main festival for Bengalis. Six days of festivities culminating in Vijaya Dashami, the last day of VICTORY (8th October). Access to Sri Ma's samadhi 8th. Date to be confirmed when Bengali Calendar published. Samyam Saptah 5th-11th November- (Kankhal) Access to Sri Ma's samadhi 12th (Purnima and Guru Narnak's birthday). Date to be confirmed when Bengali Calendar published. An International centre has been built in Kankhal ( 4 km south of Hardwar, on the Ganga), which is also 200 km north of DELHI in Uttar Khand. 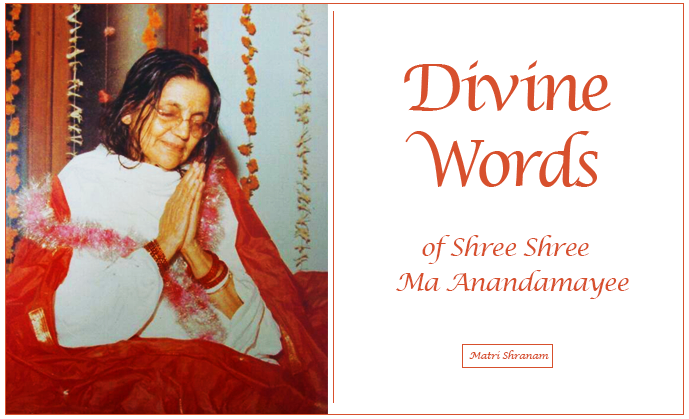 It is not meant for tourists, but for advanced spiritual seekers who are preferably acquainted with Ma’s literature as presented on this WEB SITE and publications. The Centre follows the rules of Ma’s ashrams, except those of caste purity. Visitors should be able to meditate and study by themselves, since no formal classes, hatha-yoga and meditation groups are organised. However, it is possible to meet Ma’s senior Swamis who speak English. Alcohol, tobacco, meat, eggs are prohibited,unmarried couples are advised to stay in separate rooms for the time of their retreat, to be in better harmony with the Hindu environment which is quite traditional there. Attendance to the daily ritual at Ma’s samadhi is advised, although not compulsory. The duration of stay is ten days but is extendable. There is also also other accommodation around Ma’s ashram , so staying in the area is not a problem. Ma’s other ashrams do not usually easily take Westerners.There is a small ashram higher up in the mountains 35 km from Almora in the North West on the road to Berinag:Daulchina, 263 881, Almora U.P. (phone 00 91 5962 262013). According to Ma’s request women on their own are not allowed to stay in Daulchina Ashram, which indeed is more like a hermitage. Phone/Fax 00 91 1334 246345.